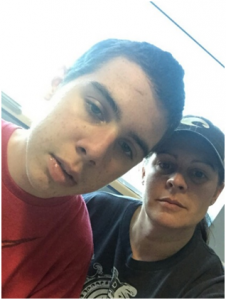 Blake's Story, Age 15, USA - The Anti NMDA Receptor Encephalitis Foundation Inc. The Anti NMDA Receptor Encephalitis Foundation Inc.
My name is Chrystal Carpenter. I am a single mom and a business owner. 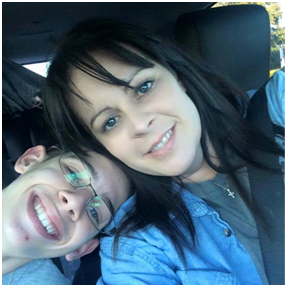 My son, Blake, turned 15 in January 2017. He was born healthy, but his medical issues began when he was diagnosed with Meningoencephalitis at just three weeks old. As a result of that, he has Epilepsy and Cerebral Palsy. It took 13 years but doctors finally identified the exact point in his brain where the seizures originated. On July 29th, 2015 he underwent brain surgery to remove that portion of his brain with the hope that it would end his seizures. I cannot begin to describe my joy when the medical team told me that his surgery couldn’t have gone any better than it did. My son quickly responded to family and even finished a joke that had been started right before surgery. Seriously. It was amazing! And just 24-hours later practically hopped out of bed to walk even though he didn’t have feeling on his left side. August 2nd, 2015 he was discharged and we went home.I would give anything to have that be how our story ends. Before they diagnosed Blake with Anti-NMDA Receptor Encephalitis in mid-September things got unbelievably worse. My son went absolutely crazy! There’s no other way to say it. The disease put his brain on overdrive. He hardly rested. He talked gibberish and used strange voices. My son used words that I didn’t even know he knew. My son saw and heard things that weren’t there. He was terrified of the dead rats in his belly button and I followed his directions and helped him remove every last one with an ice cube when he said that’s all that would work. My sweet son hit me – not once, but to the point where I was bruised and scared to death. MY son has the most generous heart. He would help anybody he could. He would never have done that to me if he were well. My son didn’t know who I was. He tapped me on the shoulder and said, “Mam, do you know where my mom is?” I don’t know how to tell you what that feels like, but if you’re a parent you’re already trying to imagine it. I don’t know how to explain how hard it was to live through all of this when he didn’t even know me. I pray that his lack of memory about this time in his life is blessing. This disease stole him and tried to keep him, but he’s fighting back.He’s been fighting back right from the start. Thankfully, even during the worst of it, MY son surfaced for brief moments. On one late night during another ER visit due his increasing violence and my inability to protect him or myself, Blake finally settled down for about 30 minutes. He’d been rigid, aggressive, and speaking foully for hours. When he rested in his seat, he looked over at me and asked, “Everything ok?” That’s MY son. I was exhausted and bruised all over. Of course, I told him everything was fine and that I loved him. An hour later he was revved up and we were back in the cycle of disease. Sometimes those fleeting moments were all I had to hold onto while we fought to make him well. My lost son. Anti-NMDARE takes everything. I was asked once not to use this picture. I was told it was too real and people couldn’t handle it. There’s so little information out there about this disease. It’s awful to go through this without any information or direction. All of my energy goes toward Blake’s recovery. But for a while now I have felt that same level of passion and commitment about getting the word out about this disease. There must parents who need information, resources, and support. There must be children in institutions who have never been tested for such a rare autoimmune disease. I cannot rest until people know that Anti-NMDARE exists and that it can be treated. Nobody should ever have to go through this as blindly as we have had to. Blake is now two years into recovery, but that recovery includes three Anti-NMDARE relapses. I am constantly on alert for the next relapse. He has come so far. He has so much farther to go.